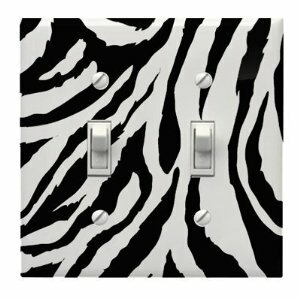 Well I came across these CUTE light switch and outlet covers! I thought they were sooo adorable and wanted to buy them for her. 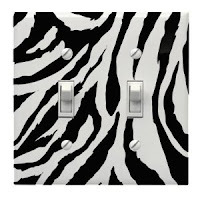 They would be such a cute little accent, to add to her Zebra theme! So here is the SUPER easy peasy and CHEAP Tutorial! Set your cover on the fabric and trace around it, and all the openings. To cut the small holes I just folded it where I drew the hols then made a little snip! Set fabric aside and bust out the mod podge. I used a paper towel under the cover so I didnt get the glue on my table cloth! Start applying the mod podge all over your cover. Once your cover is completely covered in an even layer of mod podge, set your fabric on top of it carefully to match up all the holes. Then press firmly and smooth out over the cover. Then add another layer of mod podge over the fabric. I did two coats. Let it dry about 20 minutes. These were so fast, easy and cheap, Im going to be doing all the rest of her outlet covers as well ( which will be about 4 more)! What is yours or your child room decor?? How fun would this be to really personalize the room! Oh my I just had a thought of some gorgeous damask print fabric to use on a cover!! How gorgeous would that be!? ooOOo.. I just may have to do that, for my precious niece Isabella whose room is pink and black with a Damask and Princess theme! :) What prints would YOU use for this project? So cute, so easy and I love it with the purple! Adorable - sassy and stylish! Love it and thanks for sharing the how-to! Happy 2011! love this idea, and your blog! I'm totally stalking you now...*officially*. :) I'm featuring this for whimsical wednesday at rosyredbuttons.blogspot.com tommorrow, hope thats ok! Aww this turned out so cute! I did this project, too! 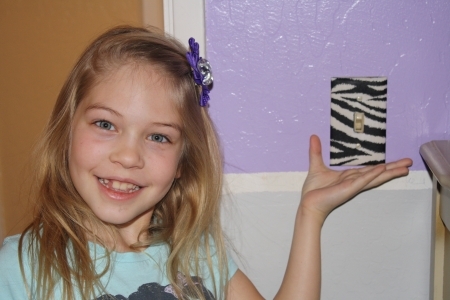 I really love that you can add a little zap of color or print onto a wall! Perfect solution....love it against the wall color...and I cn tell she is pretty pleased with it, too!! Really cute. I have lots of material scrapes that can work for this. Don't you just LOVE modge podge and fabric?? This has been my cheap go-to way to do over bathrooms and bedrooms for kids until we have the real money for a real knock-down remodel, lol. You did a fabulous job and thank you for your tutorial! I recently tried this too. I never thought asbout trying fabric. I think I will have to try this. Very informative blog in terms of knowledge, related to downlight covers. your blog would be more accurate and helpful for anyone, great job keep it up. Great Idea! 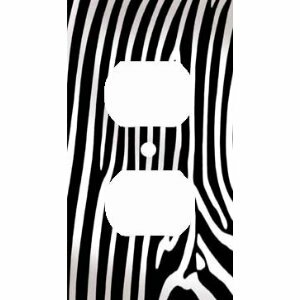 I had to get my zebra fabric out and cover my sewing room plate the same way! Thanks for the inspiration and purple is my favorite color too! 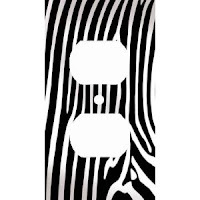 Wonderful idea Maria, My Wife Tracy and I design and manufacture wall stickers in zebra print that your daughter might like.